Metro Rail, Airport, Schools, Shopping malls, Cinemas, High-rise Buildings and fire prone areas. Insulation 1 Glass Mica tape. Insulation 3 Glass Mica tape. Maintains Circuit Integrity for 3 hours under fire condition. Zero Halogen, Low Smoke and Resistance to flame propagation. 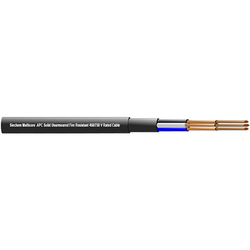 Siechem Fire Resistant Cable meets BS 7846 Cat F2 and meets Test requirements as per BS 6387 CWZ, at an enhanced voltage of 600/1000V. Siechem Fire Resistant Cable also meets 60 minute rating (PH60) to BS EN 50200 and a 30 minute rating to BS 8434-1. These tests demonstrate that Fire Resistant Cable also meets the requirements for use in "Standard" installations in accordance with BS 5839-1 2002 for fire detection and alarm systems, and Cables with inherently high resistance to attack by fire in accordance with BS 5266-1 2005 for emergency lighting. Conductor: APC -Class 2 stranded Copper Conductor. Siechem Fire Resistant Cable also meets 60 minute rating (PH60) to BS EN 50200 and a 30 minute rating to BS 8434-1. These tests demonstrate that Fire Resistant Cable also meets the requirements for use in “Standard” installations in accordance with BS 5839-1: 2002 for fire detection and alarm systems, and Cables with inherently high resistance to attack by fire in accordance with BS 5266-1: 2005 for emergency lighting. Conductor Annealed Copper conductor, Class 2 Stranded conductor. Zero Halogen, Low Smoke, and Resistance to flame propagation. 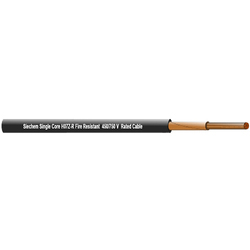 Siechem Fire Resistant Cable meets BS 7846 Cat F2 and meets Test requirements as per BS 6387 CWZ, at an enhanced voltage of 600/1000 V.
Siechem Fire Resistant Cable also meets 60-minute rating (PH60) to BS EN 50200 and a 30-minute rating to BS 8434-1. These tests demonstrate that Fire Resistant Cable also meets the requirements for use in "Standard" installations in accordance with BS 5839-1 2002 for fire detection and alarm systems, and Cables with inherently high resistance to attack by fire in accordance with BS 5266-1 2005 for emergency lighting. 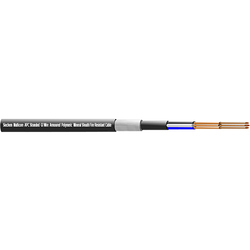 d) Siechem Fire Resistant Cable also meets 60 minute rating (PH60) to BS EN 50200 and a 30 minute rating to BS 8434-1. These tests demonstrate that Fire Resistant Cable also meets the requirements for use in "Standard" installations in accordance with BS 5839-1 2002 for fire detection and alarm systems, and Cables with inherently high resistance to attack by fire in accordance with BS 5266-1 2005 for emergency lighting.